Want to know how to board your loft? then you have come to the right place. Our skilled tradesmen have boarded many lofts in Essex and London. This article covers everything you need to know about how to board your loft. We take into account insulation requirements, storage and access. Is an ideal solution for anyone wanting extra storage space. 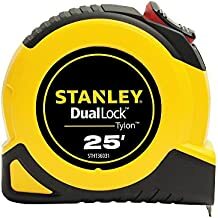 Is a great way to access heating pipes and electrical connections. But only if boards are planned out carefully. Makes the loft safer to walk around in. You do not have to worry about watching your step. These days Energy Performance Certificates (EPC) are needed when people buy or sell houses. These certificates grade the energy efficiency of your home. Better insulation properties will help improve your EPC grade, meaning your home is more efficient to run. Energy efficient homes are less expensive to run. Before you follow our ‘how to board your loft guide below’, check out the list of materials and tools needed to complete the job. Used to raise the floor by 175 mm, so that insulation can fit underneath. These boards have a tongue and grove system, which means they simply slot together. The separate boards are narrow enough to get through your loft hatch. This insulation has a thickness of 100 mm. This is ideal to install between ceiling joists, as most are 100 mm thick. This insulation has a thickness of 200 mm. 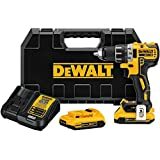 This is ideal to install 90 degrees to any wool that exists between the joist. It will mean you have 300 mm of wool insulation. 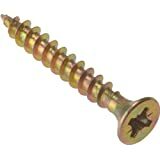 These screws are suitable for fixing tongue and groove boards to loft legs. They can also be used to fix loft legs to the joists. Many screws are required when it comes to loft boarding. You will need 8 screws per loft leg. 4 screws to fix the loft leg to the joist. And another 4 to fix the loft board to the loft leg. Pozi drive drill bits enable you to use a cordless drill as a powerful screwdriver. You will need to measure up to determine how many boards you need. Loft boarding involves moving insulation around. Usually insulation is of the glass fibre wool type. This type of insulation is harmful to your lungs if breathed in. Please do the sensible thing and ensure you wear protection. 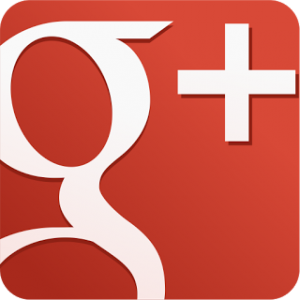 If installing glass fibre wool, then googles are a must. It will prevent your eyes from being irritated by the insulation. If you do not wear a coat or a paper suit, you are guaranteed to feel very itchy after. 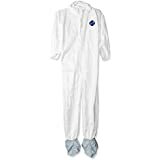 These disposable suits are also handy for other types of jobs such as decorating. Insulation requirements for lofts have increased dramatically throughout the years. Below you can see how insulation thickness has increased throughout the years. If your home is more than 10 years old, its likely you will benefit from extra insulation. The largest majority of heat lost from a building is via the roof. 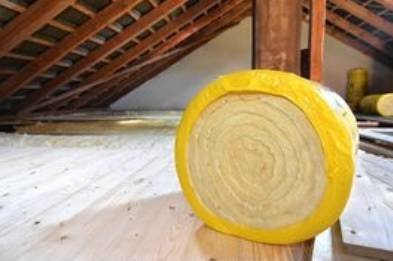 The purpose of loft insulation is to slow down the heat loss process. Loft insulation can also save you a lot of money on heating bills per year. All new homes are built to the insulation building regulations of the time. Building regulations do not require older homes to have insulation, but does recommend it. Do you have water or gas pipes in your loft? If so then ensure you board around them to ensure easy access. If a water pipe bursts the last thing you want is to be ripping up your loft boards. This also applies to important electrical connection, such as light fittings and junction boxes. The modern trend is to install down lights. However, such lighting does have a negative effect on insulation properties due to the amount of down lights required. Building regulations require a gap between your down lights and insulation. A generous gap ensures the down light will not overheat. Did you know that LED down lights can get very hot too due to there large heat sinks? Fortunately there are companies which sell down light covers that are fire retardant, and draft proofing. Be aware your floor will be raised by 175mm via loft legs when installing your flooring. Ideally you should lower the floor level next to the hatch, this only needs to be a ledge you can climb onto. It will make life easier gaining access to your loft. There are many differences between insulation. 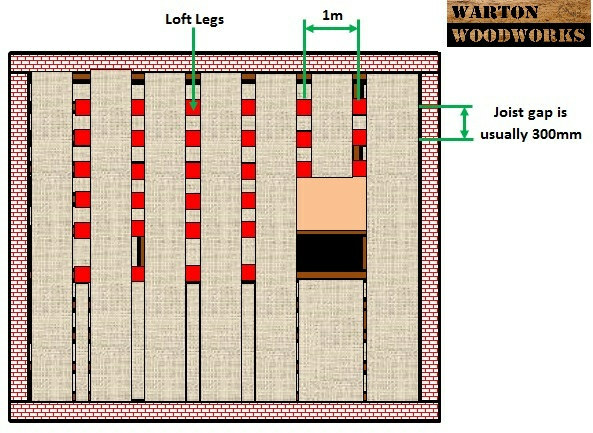 Warton Woodworks only use insulation wool, space blanket or PIR insulation boards. PIR foam board is more effective then glass wool by a factor of 2. This means 100mm of PIR is equivalent to 200mm of glass fibre wool. Usually customers go for standard glass fibre insulation. It is the most cost effective solution. The most insulated your house is, the colder your loft will be. This is because the insulation is slowing down the heat trying to escape your house. A colder loft does also means warm moist air can condensate within the loft. You reduce the amount of moist air within your home. Activities such as showering, cooking a dryer clothes create moisture. Any moist air within your home will raise when heating, thus entering your loft space. Make sure you install extractor fans in your bathroom and kitchen. Ideally you should choose extractors that directly vent to the outside, rather than recirculating ones. Make sure your loft space have adequate ventilation. Ideally there should be a cross flow of air in your loft, from one eave to another. The air enters your loft via the soffit boards within the eaves. Note: Only do this step if the old insulation has been damp due to water leakage. Or if the insulation looks like it could cause a fire hazard, such as having incredibly large amounts of dust collected on top. Note: Do this step only if step 1 was carried out. 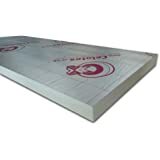 Roll out 100mm thickness glass mineral wool insulation between every joist within your loft. The top of your insulation should almost be flush with the top surface of the joists. Ensure this insulation is not covering your cavity wall gap. Decide where in the loft you want your boarding. Your decision will be influenced by the shape and size of your loft. There may also be obstructions such as vertical beams at awkward angles. Try to place your loft boarding area close to the loft hatch. Choose an area where there are no water pipes, electrical junction boxes, light fittings or anything else you may need access too. If you board over such things it will be difficult to reach in the future. Decide whether or not the whole loft needs to be boarded. Many people only board a small area of the loft to keep costs low. Also the amount of boarding should depend on how much you want to store. 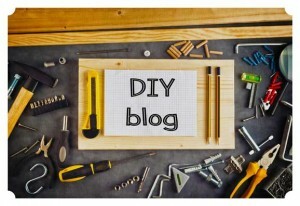 Lay a piece of plywood (cut to suit) adjacent to the loft hatch. This will make it easier to climb into the loft via your ladder. 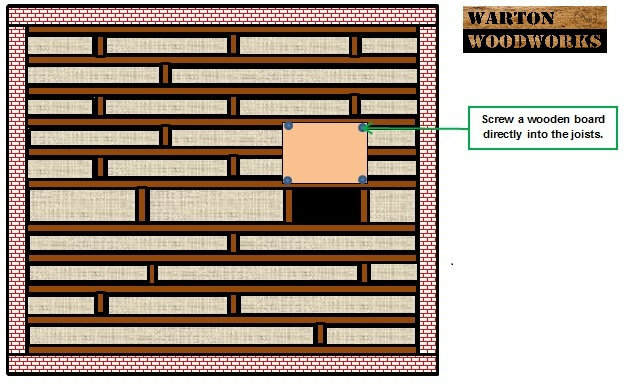 The diagram below provides an example of where your plywood could be fixed down. 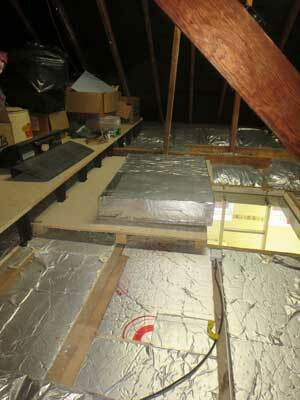 In order to achieve over 100mm of insulation, you will need to raise your loft boarding. This can be done using loft legs. Screw the loft legs directly into your floor joists. Space them 1m apart along the joists. They should be fixed along every joist the floor will be. Joists are usually spaced about 300mm apart. 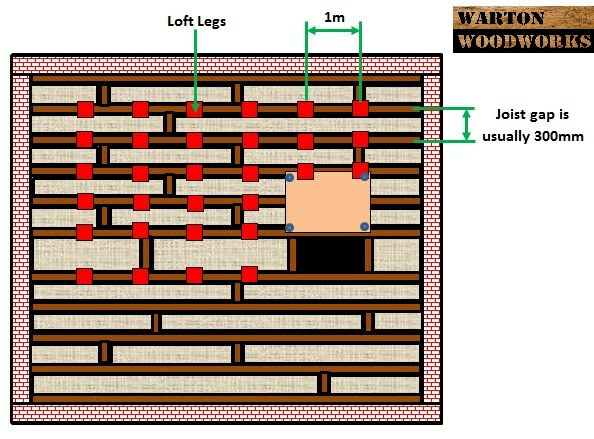 This means you will have loft legs 300mm apart between joists, and 1m apart along the joists. Insulation requirements for homes have increased dramatically over the years. Most older homes have insulation between the joists only, usually 100mm high. Loft boards were simply laid on top of the joists then screwed in. Current insulation requirements recommended by the Energy Saving Trust are 270mm. This figure is based on glass fibre wool insulation. 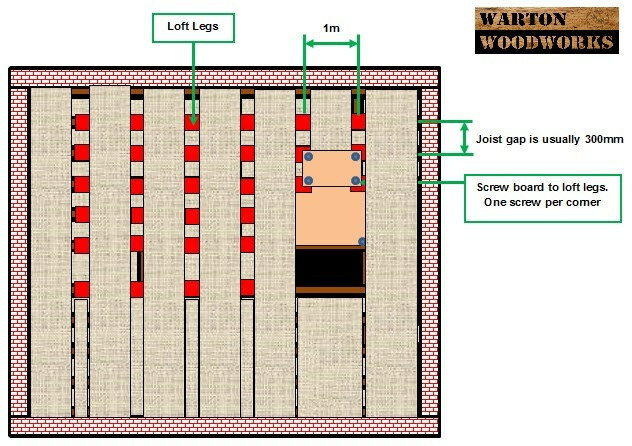 The 175mm loft legs you have installed allows a total depth of 300mm of insulation (glass wool). If you currently do not have any insulation, lay 100mm of glass fibre wool between every loft joist. Cut the wool to the correct length and width. 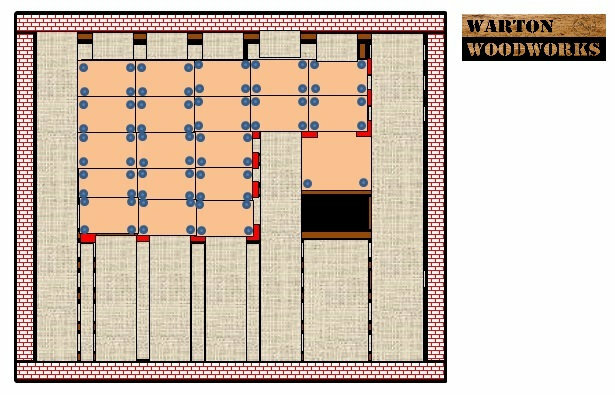 The image represents an area in your loft that will not have loft boarding. The insulation used is called space blanket. This is simply glass mineral wool wrapped in foil. The purpose of the foil is to trap the glass fibres inside, making your loft air cleaner. It also makes the job easier and less itchy. 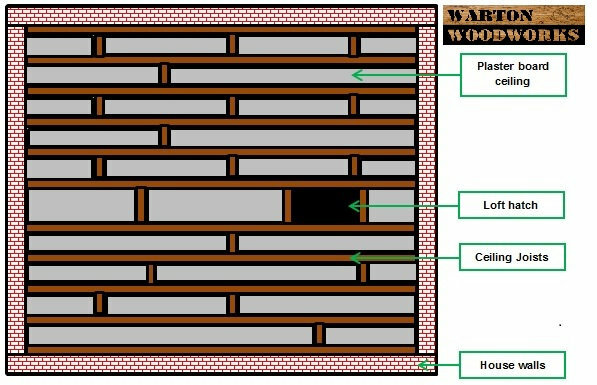 As in the diagram above there is 100mm of insulation between the joists. Then 200mm thickness insulation is laid about at 90 degrees to the one underneath. 300mm of loft insulation means you have achieved over the recommended 270mm of insulation. 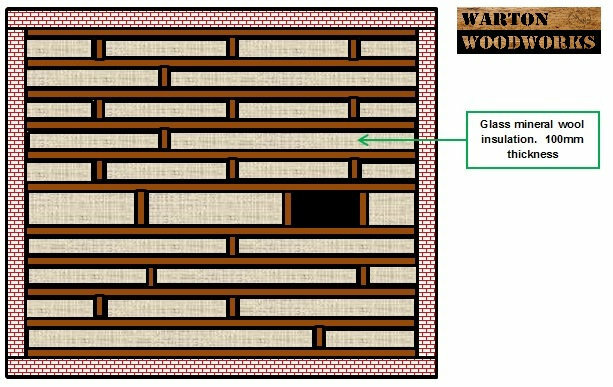 Please note that 150mm of PIR foam board insulation is equivalent to 300mm of glass mineral wool. However, mineral is a much cheaper solution. Screw your first loft board down on top of your loft legs, close to the loft hatch. 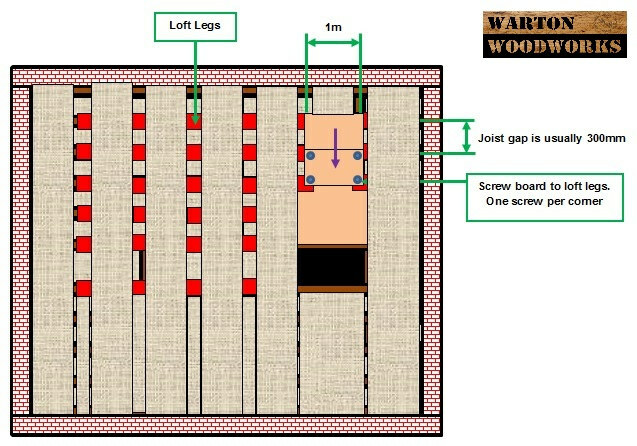 Use 2 screws per loft leg to fix the boards down. One board should have a total of 8 screws in it. Slide the second loft board into place, so that it joins to the first one. Make sure the orientation of the loft board is correct. Tongue and groove boards are designed to slot together. Now screw the board into the legs beneath it using 2 per leg. This board should also have a total of 8 screws fixed into the loft legs. The image has a total of 300mm of space blanket insulation. This is glass mineral wool wrapped in aluminium foil. The purpose of the foil is to help prevent the glass fibres from flowing through the air. Below is some alternative insulation that can be used within lofts. Space blanket is glass fibre wool wrapped in aluminium foil. It offers more protection against itchy fibers, making it more comfortable to lay. It also have a heat reflective foil surrounding it. PIR board is twice as efficient then glass fibre wool. Therefore 100mm of kingspan is the same as 200mm of fibre glass wool insulation. This may be a good option if your loft space lacks height, or you want a neater finish. The great thing about this type of insulation is that it creates a tight seal, as its cut to size. 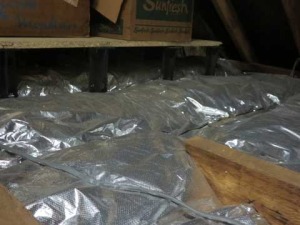 Below is a picture of loft legs being used with space blanket insulation. Loft legs are spaced about 30cm apart between every joist. Tongue and Groove chip board is then screwed to the loft legs. Below is an image of a loft being topped up with more insulation. 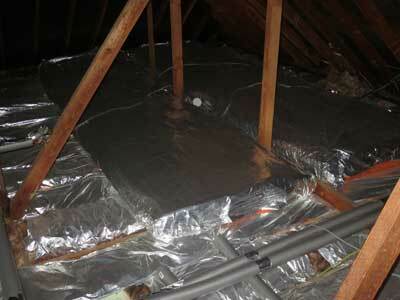 After we installed space blanket insulation between the rafters, we then placed 200mm space blanket on top. Always make sure you apply more insulation cross ways (90 degree’s to the insulation underneath). This helps to prevent cold spots within your loft. Below is an image of a loft entrance. Floor level is lower at the loft entrance compared to the storage area. This ensures easy loft access. PIR foam board (kingspan) insulation has been installed around the loft entrance. This customer wanted the very best insulation above his cold bathroom. Other areas of this loft use space blanket. The kingspan insulation also allow the customers to freely walk around his loft where no flooring is present. We hope you enjoyed this how to board your loft guide. Please feel free to share it! We done a hip to gable loft conversion on the bungalow, in the image below. 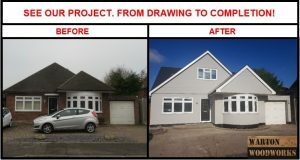 See how we done it step by step, includes over 100 images from architect drawings to completion.